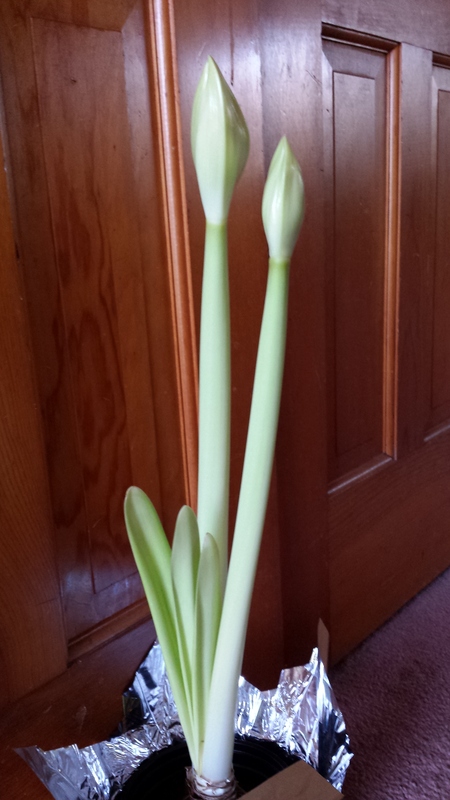 At long last, I will have an amaryllis for Christmas. I forced this one–literally, by potting it up right before Halloween and putting the pot in the room where our furnace is–the warmest place in the house. That’s why the color is still a little pale–it needs to adjust to being in natural light. I still have two other bulbs in reserve, to save for after the holidays–as well as my bulbs that I’ve “summered over” from prior years so I’ll have quite a colorful winter. But this year I’m leaving on my winter trip before New Year’s. I won’t be putting up most of my decorations because I won’t have time to get them down again before I leave and the house sitter arrives. I’m not complaining–it’s a lovely problem to have–but the house seems a bit barren of decoration. And The Spoiler is whining. So it’s plants to the rescue! Previous Article Fraser or Balsam or Something Else?